A first sighting of an unexpected bird or an elusive mammal is a real thrill and can encourage a lifetime's interest in nature. 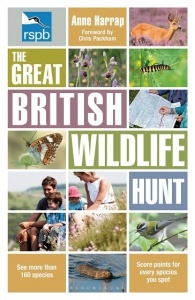 This new RSPB book is perfect for anyone who enjoys a walk in the woods or a coastal stroll. It isn't a site guide directing you to the same old sites, instead The Great British Wildlife Hunt encourages you to actively find species everywhere you go, by learning to recognise landscape features, habitats and niches, and spot other signs that a species is nearby. Each species has a score to inspire friendly competition on your days out.